Select the Amish Concord Stationary Bar Stool and enjoy all natural, handcrafted American made stools for your home furniture collection. Slender spindles contribute to the chair back of this Windsor style dining room chair. Its lightweight design and bamboo style legs make it a popular choice for colonial style furniture collections. Classic Windsor style has seen many revisions throughout the years, remaining a favorite for dining rooms, porches and gardens everywhere. 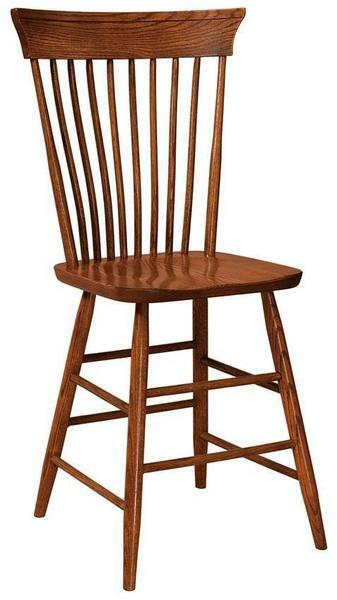 View the matching Concord Swivel Bar Stool and the Amish Concord Kitchen Chair/Dining Room Chair as well. Our Amish made bar stools are stylish, sensible and save you space. Make great use of your kitchen bar or counter with a set of solid wood bar stools hosting casual dinners, afternoon snacks, morning coffee and evening work projects. Wood bar chairs offer a versatile seating option and provide extra seats when family gatherings overflow from the dining room into the kitchen. Host pizza nights at your kitchen island or supply your game room with this stylish seating. Take a look at our blog post, Beyond the Bar: Other Uses for Bar Stools for more ideas for bar stool seating throughout your home. Style these early American chairs in the wood type you like best, with just the right stain to match. Select samples from a variety of options to work with as you decide. Get the right height with a 24" counter height and a 30" bar height offered in this style. Rustic woods are available with open or filled knots and your option to create an upholstered bar stool is supported with a large collection of fine leathers and fabrics to pick from. Seat Height from Back: 21 1/2"